The Scotmid team celebrate after their win. "These prestigious awards show that Scotmid Barnton is leading the way in convenience retailing, while remaining at the heart of the local community." 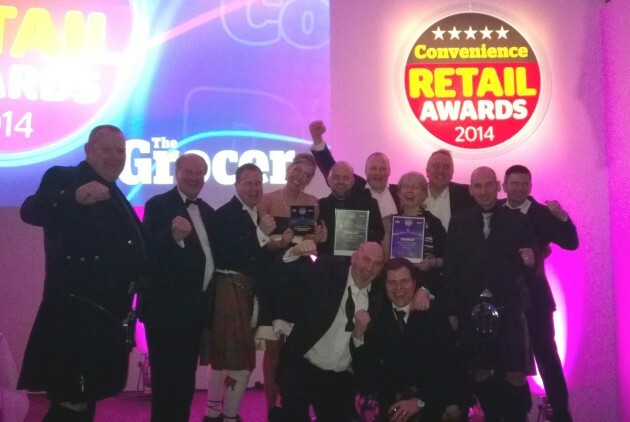 Scotmid Barnton in Edinburgh has scooped two prestigious awards at last night’s 2014 Convenience Retail Awards. The store was crowned the Best Multiple Convenience Store in the UK and picked up a second award for the Best Use of Technology. Scotmid Barnton was recognised by the judges for its outstanding service, local supplier product range, customer facilities, fresh and local produce, and the design and layout of the store. The store was also praised for its engagement with the local community. Staff have raised over £3,000 for their local primary school in Cramond and have held a number of fundraising events for the school in-store. The Barnton store won the Best Use of Technology award for its interactive customer touchscreen, which is used to communicate with shoppers and engage with the local community. Customers can use the touchscreen to find out about community events, news and special offers. The interactive screen can also be used to give feedback to staff and find out about Scotmid’s work with local suppliers, as well as charity and community activities. Scotmid Barnton was completely refurbished in April 2013 to improve the shopping experience for shoppers. A host of new customer services have been introduced, including an in-store bakery, artisan breads from The Breadwinner Bakery, freshly ground coffee and orange juice. The range of fresh produce, craft beer and specialty wines, meat and fish, and products from local suppliers have all been expanded to give customers a greater choice and variety. This is the second year that Scotmid has won the Best Multiple Convenience Store award, after Scotmid Warrender Park in Edinburgh picked up the prize in 2013. The Convenience Retail Awards are the most prestigious awards for the convenience store sector in the UK.